Stamp collecting and preservation as a hobby can become expensive if you get carried away with it. However for the majority its just a question of keeping a few stamps in an album. This is something that all the family can do, and it can keep children quite for a few hours too. It can be interesting as stamps reflect the history of a country such as political change, military conflict, disaster, scientific success and sporting achievement. Avoid keeping them in moist conditions. Try not to handle them too much as this risks damage, and human skin can cause discoloration when in contact with older stamps (particularly those that used cow gum adhesive). Keep out of sun light most stamp colours will fade. Also try to keep away from a smoky area or they may become discoloured and smell of smoke. If they are kept loose they should be in a rigid container, like a box or a tin that is not rusty. Some collections are sorted into envelopes, this can be a cheap useful way of keeping duplicate copies, and for pre-sorting them prior to insertion in a folder or album. There are not many good value stamps around. I personally don't worry about their value, I just like sorting through them and try to complete part sets. Any stamp whatever its condition is better than not having one of that period or set. Even damaged and dirty stamps can have value, for example. A crumbled penny black is still worth a pound/dollar or two, because they are rare and people want to fill gaps in their collection. There are many suggestions on what to collect. You don't have be specific about one idea only. For example, many people collect just flowers, fish, birds, trains, football, paintings, sport, space stamps etc.. A specialist theme can often be more interesting and enjoyable to look at. But most people tend to concentrate on their country as those stamps are more easily obtained. Some people still use stamp hinges to stick the stamp in albums. These are adhesive strips they become sticky when wet. They are folded to enable one side to stick to the stamp and the other to stick to a page. You do not need expensive albums to keep stamps in this way. Any type of folder can be used, get a hole punch and ideally use a stiff plane paper. The only drawback with stamp hinges is that they can damage the back of the stamp if they are removed for any reason. Many people write the country name at the top, some have the pages numbered by the year, others put one set only on each page (this can look very attractive for larger sets or similar stamps). Never lick the back of the stamp to use its own adhesive, you do not know where it has been and this may damage the stamp. These are the modern way to look after stamps. It is easier to move stamps and insert others next them without damaging the stamps. However stock books can be expensive, they are bulky and heavy. This is my preference as they protect the stamps better. Some stock books have tracing paper or semi transparent sleeves to put the stamps in (as on the right hand image), others have a clear plastic sleeve that allows the stamp to be seen clearly (as on the left hand image). These albums are likely to be worth more than all the stamps you put in them. If you want to sort stamps into their year and country you may wish to buy a catalogue. These show the stamps sorted by country, year and sets. They will usually show the value of new and posted stamps. The prices shown are for good quality stamps. Most used stamps will often be worth no more than 10% of those prices. There are many online web sites that can provide this information, but only a few are free. Rare does not always mean valuable. There are many stamps around that are not listed in catalogues. These may not have been issued officially for postal use or were only used in small quantities for use by a restricted group of people. 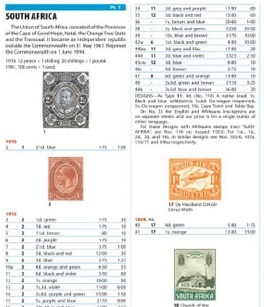 Some of the unlisted stamps can be valuable to specialist collectors. These can include stamps used for stamp duty, military use, foreign embassies, samples, special commemoration sets, shop discount/saving stamps such as green shield or tea stamps. This can often be difficult when you first get started. There are some useful web sites that can help with common stamps. 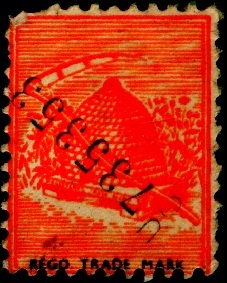 The harder stamps to identify tend to be those with no English words or letters, and particularly for countries occupied by foreign powers during periods of military conflict. 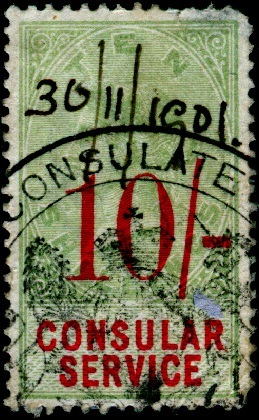 Occupied countries tend to have "overprinted" stamps where the new country name is printed on top of the stamp in the language of the occupier. These can be on the countries own stamps or on the stamps of the occupying country. There are also "surcharged" stamps. These exist where the price of the stamps have either increased due to inflation, or where the currency has changed.